It is incredible to believe that it's been five years since Pink's last studio album ('The Truth About Love'). However, during those years she has been far from idle; a worldwide tour to promote the album, several film roles, the birth of two children and a collaboration with Dallas Green (using her real name Alecia Moore) called 'You + Me' have kept her occupied. She's also found the time to record two non-album singles that unfortunately do not feature on this new release. The Reviews Ed and I opted to review this as we both share a fondness for the blonde bombshell's more Rock-infused material. 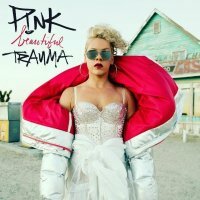 'Beautiful Trauma' is Pink's seventh album and possibly her most introspective release to date. It finds her delivering thirteen songs that will be appreciated by anyone who has been involved in a turbulent yet fiercely loving partnership. Thematically, the songs are relationship-related and reminiscent of the 'Funhouse' album in the way they are used to channel and vent feelings associated with the ups and downs that being with someone can generate. Unfortunately, any guitars are really low in the mix which means the album is far more Pop-orientated and the Rock element is practically non-existent. The emotionally-charged vocals are fantastic throughout with 'Wild Hearts Can't be Broken' being a particular standout. Lyrically, as you would expect, no punches are pulled and the "Parental Advisory" sticker is well merited. The duet with Eminem ('Revenge') is quite amusing and surprisingly a favourite, along with the title track, 'Whatever You Want' and current single 'What About Us'. On previous releases, Pink has collaborated with the likes of Butch Walker and Mitch Allen (SR71), and this has resulted in great crossover appeal. They have had no involvement this time round and sadly that has greatly impacted on the style. I would have liked 'Just Like Fire' (from the 'Alice Through The Looking Glass' soundtrack) to have been incorporated to add a little more variety and tempo, but that I guess is a small quibble considering the quality of the songs that have been included. Anyone who listens to mainstream radio will hear most of these songs during the next twelve months or so (in edited format, of course) and there will always be a place for Pink in my music collection. Melodic Rock fans will find little to get excited about, but those with an open mind will be well rewarded.